A D-Dbar event in the CLEO-c detector. The CLEO Collaboration operated the CLEO high-energy physics detector for nearly thirty years, from 1979 to 2008, recording the particles produced in electron-positron collisions at the Cornell Electron-positron Storage Ring (CESR). 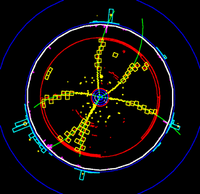 CLEO carried out a broad physics program of studying the production and decay of bottom and charm quarks, as well as tau leptons, in order to probe the strong and weak nuclear forces and to search for new phenomena beyond the Standard Model of particle physics. To meet the evolving needs of this wide-ranging physics program, the CLEO detector underwent five major upgrades, each time incorporating new technologies in particle detection and identification, as well as implementing advances in computing and software.